The Accent Hatchback gives you the option to load up gear through the rear hatch with incredible ease. You’ll never have to leave your snowboard or surfboard behind again. A suite of enhancements that makes your driving experience better and comes with every new vehicle we sell. 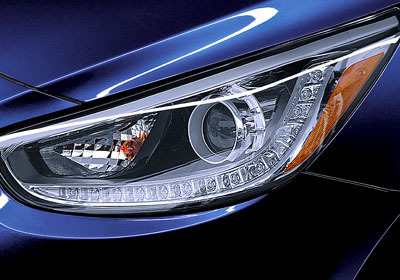 So wherever you turn, Hyundai is there with a long list of smart features. The Accent features an eco-efficient 1.6-liter GDI engine that generates 137 horsepower and 123 lb.-ft. of torque. The Dual Continuously Variable Valve Timing (D-CVVT) helps improve torque and enhance fuel efficiency so you spend less time at the pump. This 4-cylinder can be coupled with a 6-speed manual or 6-speed automatic transmission with SHIFTRONIC®. When the sun goes down, the available projector headlights with LED accents and fog lights give you a better view of the road ahead and get noticed by those who appreciate thoughtful design and attention to detail. When you first look at the Accent, you may find your eyes being drawn to the ground. And that’s okay. The Accent Sport Hatchback has standard 16-inch, alloy wheels with low rolling resistance silica tires. This combination provides great style, and optimizes fuel economy at the same time. 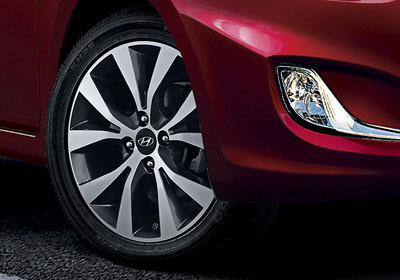 These distinctive 16-inch wheels are also available on the SE Sedan. 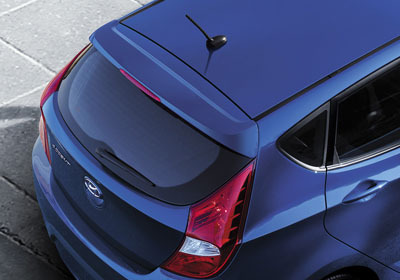 The fluid styling of the Accent Hatchback extends all the way to the rear spoiler and its unique, aerodynamic design. So it doesn’t just add a sporty visual element—it helps you glide down the road more smoothly and efficiently. The Accent Hatchback has room for your friends and their bags: A surprising total interior volume of 111.3 cubic feet to be exact. It also has more cargo space with the rear seats up than the Toyota Yaris and Chevy Sonic,* allowing more room for the gear you don’t want to leave behind. See how we design every vehicle to compete at a class above its price range. Ease down the road with standard features that include glare-blocking sliding sunvisors, a one-touch triple turn signal and an available auto-up driver’s power window control. Plus, inside you’ll find front map pockets with bottle holders, a storage tray, dual front cupholder, a front glove compartment and available sliding armrest with storage. A 6-speaker audio system guarantees great sounds. SiriusXM Satellite Radio, smartphone and auxiliary input jacks let you listen to even more of your favorite music loud and clear. Change the station, turn up the volume, or engage cruise control without ever taking your hands off the wheel. You will enjoy available steering-wheel-mounted audio and cruise controls that help enhance your driving comfort, confidence and control. All Accent models with automatic transmission have an Active ECO System that modifies engine and transmission control for improved fuel economy. Based on internal tests, this system provides improvement in real-world fuel efficiency. That’s a big difference. Here’s one set of features we hope you’ll never see: The airbags. But it’s comforting to know they’re there. All six of them. The Accent is equipped with front, front side-impact and side-curtain airbags to help protect you if the unavoidable occurs. Designed to help prevent loss of traction, the Traction Control System (TCS) detects wheel slip and applies the brakes as needed, then transfers power to the wheels that are stable. It’s the type of control you can expect from the Accent. You can control your ride with confidence knowing you have Electronic Brake-force Distribution (EBD). This dynamic system balances braking forces at each wheel to help you maintain control during sudden braking. So you can brake with poise and composure each and every time.